Have a WePay account already? How to connect my bank account if I skipped it the first time? As of now, WePay can only process transactions for businesses registered in the United States and can only accept payments in USD. You can start receiving payments via WePay, as soon as you’ve verified your email address and filled in your business details. The email verification link sent to you will expire in 90 days. If your bank account is not connected with WePay, the payments received will not be transferred to your bank account. In times like this, the payments received will be withheld by WePay and will be transferred to your bank account once it is connected. The payments held by WePay will be refunded to the customers if the bank account is not setup in 30-days from the day of receiving the first payment. 1. Navigate to Gear icon > Integrations > Online Payments. 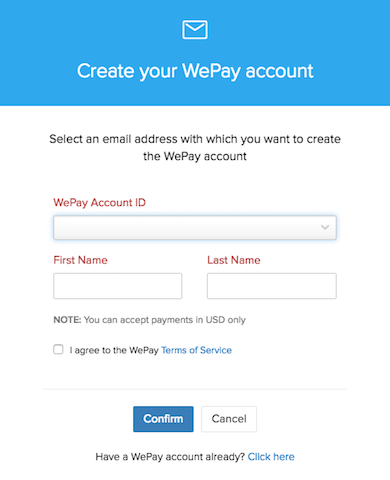 Now, click on the Create your WePay account button under WePay to get started. 2. 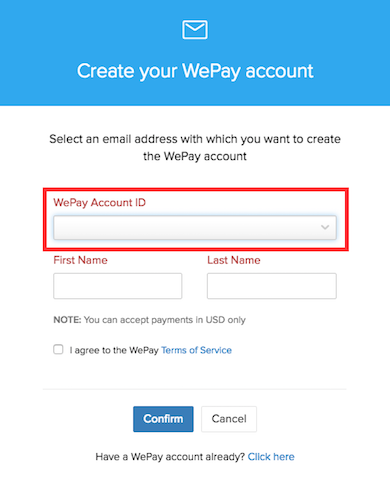 To signup, select the email address from the drop-down with which you want to create the WePay account with and click on Confirm. Note: Only the Admin Users’ email addresses will be displayed in the drop-down. How to add an Admin User? 3. You’ve now successfully initiated the WePay setup process. 4. Now, login to the selected email account and click on the email with the subject WePay - Activate your account. 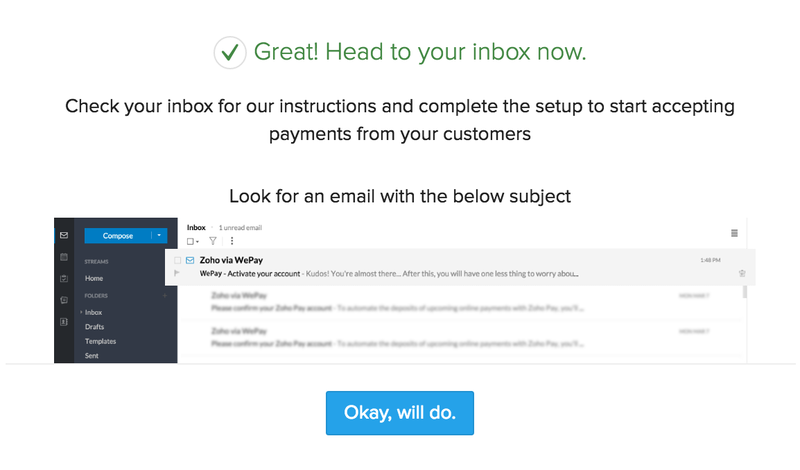 In the email, click on the Proceed button to validate your account and you’ll be redirected to WePay to finish the setup. If you do not receive the confirmation message within a few minutes, kindly check your Spam folder just in case the confirmation email got delivered there instead of your inbox. You can resend the verification email under More Settings > Integrations > WePay. 6. In the login page, enter a password for your WePay account and click on Grant Access. 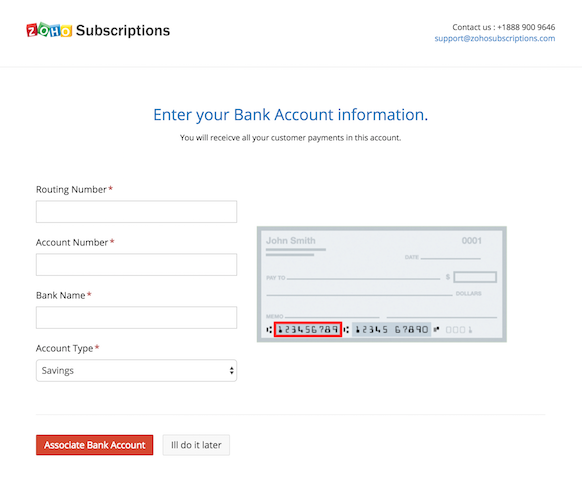 Note: The password entered here is independent from your Zoho Subscriptions password. 7. In the next screen, fill in your personal and business details and click on Save & Next. Note: After this step, you can start accepting payments. 8. Enter the bank account details to which the payments are to be transferred and click on Associate Bank Account to complete your WePay setup. After adding, select the email address in the WePay setup popup from the drop-down list. 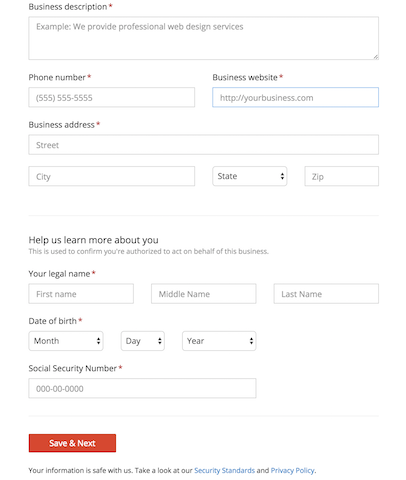 Click on the verification link sent to the email address and fill in the business and bank account details form and click on Associate Bank Account. Navigate to Gear icon > Integrations > Online Payments. Click on Manage account under WePay. You will be redirected to WePay to finish the process. Login to WePay and and click on Settings. Select Withdrawals from the left pane and click on Link your bank account. 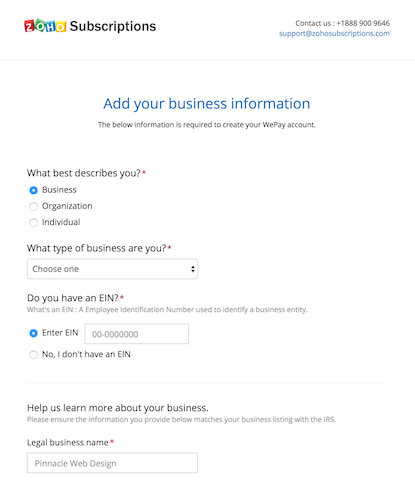 In the screen next, enter your business information and click on Continue. Next, enter your bank account informations to which the funds has to be transferred and click on Continue to connect your bank account with WePay. 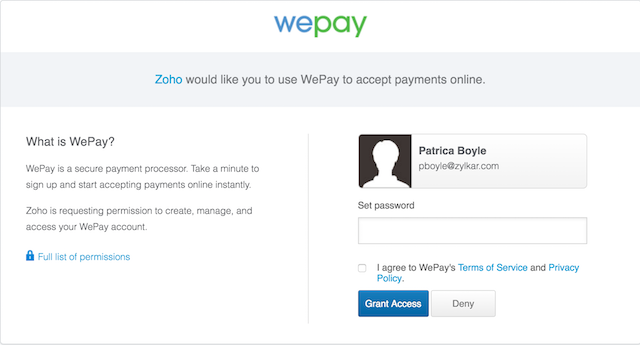 Navigate to Gear icon > Integrations > Online Payments and click on Manage Accounts or Transaction history under WePay. You will be redirected to WePay to finish the action. To login, use the username and password entered in the step#6 of the setup process. Note: When you integrate with WePay, the following details will be shared with them.